Continuing the backlog of blog-posts for 2016 so far, here's nr 2. Proper smocking is one of the things on my to-do list and this was perhaps not the day I got round to it, but it's a step on the way. A mini project, too: the ever-adjustment of the shift goes on. My first camisia/15th century Italian shift was originally done in about 2007. I finally got round to fix the neckline before the masked ball in November, and this time I decided to smock the sleeves, that are wide rather than long and therefore hard to put on properly under tight sleeves. For the larp in January I added smocking threads, three per cuff. 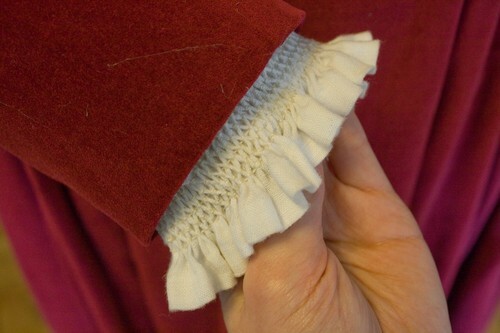 The folds are at about 0.5 cm apart and the threads about 1 cm apart, creating a narrow but functional cuff. After the larp I experimented with honeycomb smocking. Not entirely pleased with the outcome, I think the folds should perhaps have been closer together and/or deeper. Now I left the smocking-threads in in order to keep the shape of the cuff, and it's still a bit too wide. Next time I'll make an open cuff and make it broader. Still, since the smocking thread is white I think it looks ok, and it serves its purpose: to make the sleeve go more nicely under tight-ish sleeves. Not too bad, even if it's sloppy work. How historically accurate is it? Uhm, say 80% or so. Looks ok from a distance, but as smocking go it's not very impressive, I have no good reference for a narrow smocking and the thread should of course not be cotton. Hours to complete: About 6, it takes surprisingly long time. First worn: In its present state, not yet I think. Total cost: Nothing, thread was from an old relative's stash. If I would have made the entire garment new, about 30 euros.